Any portion of the liturgy which begins with the words "Blessed be Thou, O Lord" ("Baruk attah Adonai"), or which ends with an abstract of itself introduced by these words, or which both begins and ends thus, is known as a benediction ("berakah"). When it is read aloud by a leader, for instance, at public service at which ten or more men are met, or when grace is said where three or more men have eaten together, or even where the master of the house pronounces the sanctification ("Ḳiddush") of Sabbath or of a festival before his wife and children, the congregation or company answers "Amen" at the end of each benediction. The meaning of this word is "true" or "truly"; but its use in the Greek of the New Testament indicates that at this early age it was deemed to be technical and untranslatable. The origin of this sort of response can be traced back to the double "Amen" at the end of the first, second, and third books of Psalms; e.g., "Blessed be the Lord forever, Amen and Amen." The Mishnah (Ber. viii. 8) fully recognizes an established custom when it warns the faithful that while they may boldly say "Amen," thus giving assent to any berakah pronounced by an Israelite, they must not so respond to the benediction of a Samaritan unless they have heard every word of it. A Babylonian teacher (Ber. 45a) warns those who respond not to cry out "Amen" louder than the leader has recited the benediction; for the Psalmist says (xxxiv. 4 [A. V. 3]), "Magnify the Lord with me." After the third benediction in grace after meal, the word "Amen" is spoken by those who recite the benediction along with it (Shulḥan 'Aruk, Oraḥ Ḥayyim, 188, 1). This custom originated as a hint to working men eating at the master's table, that they might leave without staying for the less obligatory fourth benediction (see Ber. 46a). In the Temple, however, when a benediction was pronounced, the response, on the authority, it is claimed, of Neh. ix. 5, was "Blessed be the name of His glorious kingdom forever and ever," as related in Yer. Ber. ix. 5, and repeated thence in Bertinoro's commentary. 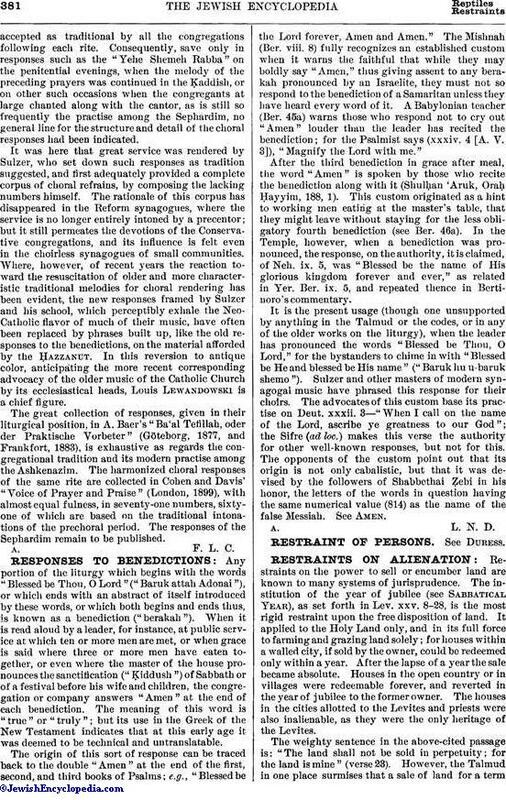 It is the present usage (though one unsupported by anything in the Talmud or the codes, or in any of the older works on the liturgy), when the leader has pronounced the words "Blessed be Thou, O Lord," for the bystanders to chime in with "Blessed be He and blessed be His name" ("Baruk hu u-baruk shemo"). Sulzer and other masters of modern synagogal music have phrased this response for their choirs. The advocates of this custom base its practise on Deut. xxxii. 3—"When I call on the name of the Lord, ascribe ye greatness to our God"; the Sifre (ad loc.) makes this verse the authority for other well-known responses, but not for this. The opponents of the custom point out that its origin is not only cabalistic, but that it was devised by the followers of Shabbethai Ẓebi in his honor, the letters of the words in question having the same numerical value (814) as the name of the false Messiah. See Amen.